When my cousin Danny would drive up to the Stockbridge-Munsee Mohican reservation, red tailed hawks would follow him. They coasted next to his truck sometimes for a mile at a time at eye level. When Danny made the bustle for his regalia, he used red-tailed hawks. He was too kind hearted to kill them; he used roadkill. When he died suddenly and without any warning from two heart defects we hadn’t known about, his chosen family from Stockbridge led a traditional funeral for him and for his family down in the Chicago area. When folks started to look at the sky, I was surprised. Eagles only come to Native funerals, I thought. I was partly right. It wasn’t an eagle. It was a red-tailed hawk. After we were through, it landed on a chain-link fence next to us, and waited patiently until we’d all assembled. It especially waited for Danny’s mom and brother. After it was sure it had all of our attention, the hawk turned west — the direction of death in both the Irish and Mohican traditions — and flew away swiftly. This tattoo is for him, and for that hawk. 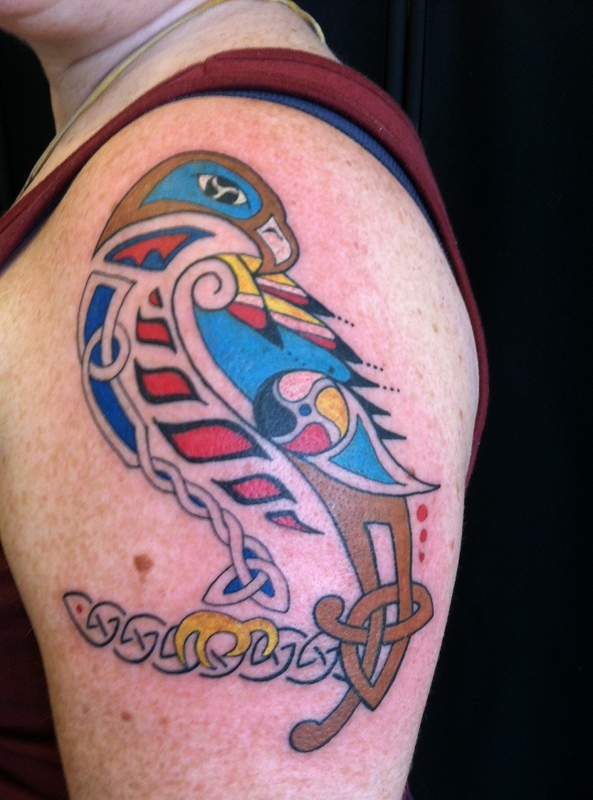 It is a combination of Irish influences (specifically, the Book of Kells) and modern Mohican artwork. I also incorporated a Celticized version of the medicine wheel Danny used when helping people who were sick or lost in his role as a Pipe Bearer: the colors of the four directions that mattered to him, but in a modified quadruple-spiral (rather than the triple spiral in most Irish art). I miss him so much. My heart still twists like a shard of metal is trapped in it when I think of him, even when I am smiling through my tears. He was too young, and he was too kind, and he was too smart to leave us this soon. So says me, selfishly. Danny and the hawk had other ideas. So much thanks to Awen Briem, Art With a Point, for bringing this to life for me. You are AMAZING.